Mr. Nicholls, a native of Canton, North Carolina, received his undergraduate degree from UNC-Chapel Hill in 1965, and his law degree in 1967. From 1967-1971, he was a staff attorney with the Internal Revenue Service in Oklahoma City. 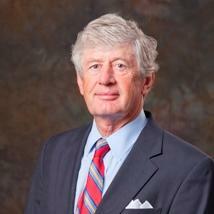 He represented the government before the U.S. Tax Court in Oklahoma, Texas, Arkansas and Kansas. After a year in private practice in Georgia, Mr. Nicholls relocated to Raleigh. Six years later, he helped found Nicholls & Crampton. Mr. Nicholls concentrates his practice in the areas of real estate, general business, business organizations, wealth transfer and tax and estate planning. He is a member of the North Carolina and Wake County Bar Associations and has held leadership positions in numerous professional, community and church organizations. Mr. Nicholls has received a Martindale-Hubbell® Peer Review Rating of AV® Preeminent™. This is the highest rating given for legal ability and ethical standards. Various Tax Topics (CLE), NC Bar Assn.